Jasmine always loved flowers, so she decided to share their beauty with everyone. She began with a single flower shop and soon managed shops all around the world. Whether it was Mother's Day or Valentine's Day, a bouquet of flowers to celebrate a special event or just to show compassion, Jasmine knew exactly what her customers needed. Lately, however, her passion diminished and her business declined. Now Jasmine wants to revitalize her flower shops, but she needs your help! 60 balanced levels across 6 countries! 47 types of item upgrades to buy! Bloom! A Bouquet for Everyone is rated 3.1 out of 5 by 14. Rated 5 out of 5 by Alexiell from Fun Time Management Game ! Yes it's old, yes it's repetitive and yes there are no relaxed mode but this game is super fun. 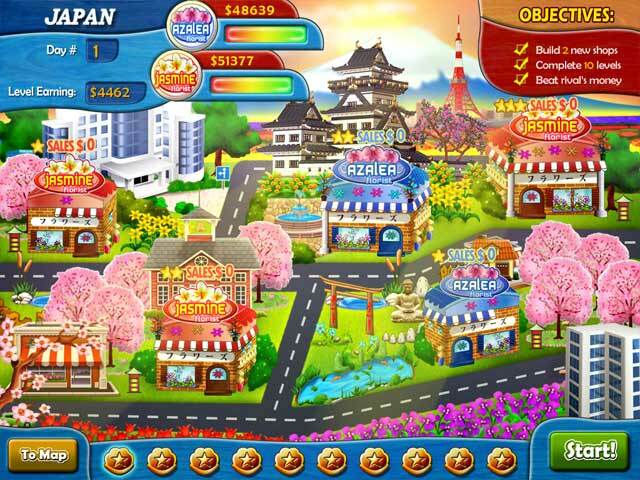 I am a fan of management game and this one is a good one. Lovely characters, cute story, good gameplay, challenge and trophies. It runs perfectly on my W10 laptop without bugs. I've also play Bloom! Share flowers with the World: Valentine's Edition and it's great too. For TM fans only ! Happy Gaming ? 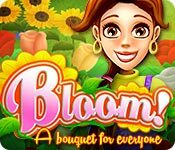 Rated 5 out of 5 by pennmom36 from FUN CLICK AND DRAG TIME MANAGEMENT GAME, HOWEVER..... Bloom! is a fantastic click and drag type Time Management game, however, this one is the same as the other two in the series. Nothing has changed as far as I can tell, except for the types of flowers offered. If you own either of the other two, you're probably going to be disappointed, if not, you'll probably love it, if you don't mind the click and drag feature. There are six different countries to visit, the United States, France, New Zealand, Netherlands, Denmark, and Japan, with 12 different Achievements to earn along the way! The goal is simple, serve your customers as fast as you can, while keeping them happy (as indicated by the amount of hearts shown) so that they will leave you a big tip. When the customers come in, they will have an image of what they want inside a thought bubble, and you click on the customer to drag them to their desired location. They may want to sit down in a cozy chair and drink a glass of orange juice or read a flower magazine first. Once seated, you deliver the necessary items and you will have to refill the orange juice container occasionally and pick up the dirty glasses when they leave. 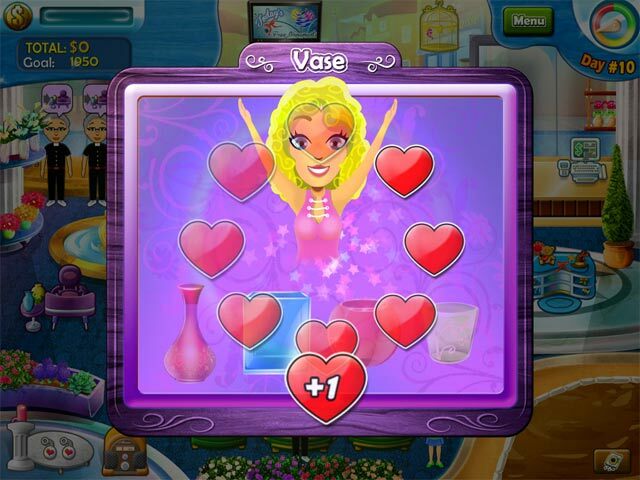 Next step is choosing a vase, you drag the customer to the vase chair and a pop up window appears with several vase options, scan over the vases until the customer smiles and click on that vase. Next step is the bouquet department, drag the customer to that station, another pop up window will display flowers, and you'll need to click on the flowers the customers thought bubble shows, in order, and if they want an accessory, you'll need to drag them to that booth, otherwise, just collect their money at the cash register. The flowers won't reproduce on their own, so you must constantly grow a new supply while waiting on the customers. The bottom right is your garden, first click the icon to plant the seeds, when that is done, a watering can icon will appear so you can water the flowers, the final step is to cut the bouquets when the scissors appear, and the Flower Booths will automatically refill, you may need to repeat the process throughout the day. 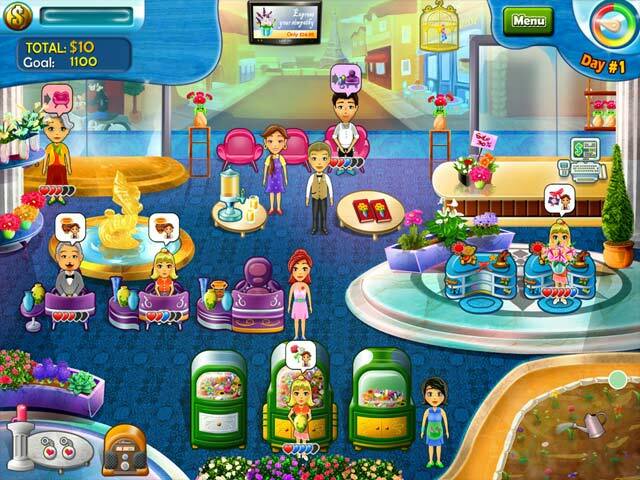 At the end of each level, you will get the opportunity to purchase upgrades, more chairs, more flower bouquets, items to make customers happier, such as a Keychain to give to customers to add a heart, Fragrance Candles to add a heart to each customer, a Jazz Radio that when playing will give all customers the maximum amount of hearts, a Butterfly Cage, that when opened, will make the customers leave a better tip upon exiting, and Bouquet Rain, to make it rain flowers to give everyone. You can even hire employees to help Jasmine with the customers, at the different Flower Stations available. BLOOM! GAMES AVAILABLE Title***Release Date***Average Rating -Share Flowers With The World 1-28-15 4.2 -Share Flowers With The World Valentine's Edition 2-3-15 4.0 There is a quick tutorial for the first level that will show you how to play this game, and it really is an easy (but very addictive) game to learn. The hard part is mastering TM games, because each level gets progressively faster, and more tasks are constantly being added as you get more and more customers. Steer clear if you're not a fan of fast paced games, because I didn't see an option for a Relaxed Mode of Difficulty, otherwise enjoy! Rated 4 out of 5 by malibuhanna from Same game but fun Well, It's the sequel... except that it is the same game, with no changes at all except for the little cut scenes in between. But let's face it, they didn't make sense in the first part, nor do they in this one. It's still a very fun and addictive game though. If you liked the first one, you'll like this one. Rated 4 out of 5 by beckins from All good but no buy While I realize there are two games in the series before this one, this is the first Bloom game I am playing. Really enjoying the first eight levels and would be moving on but for one thing...no relaxed (and I mean untimed) mode. Yes I do realize that the timer is the whole point of a TM game, but due to age and disability, I like to play for the fun of organizing my moves. I love to organize and TM games keep me happy for hours, unless there is a timer. I used to play against timers but find I can no longer finish games in a full timer mode. Relaxed mode would have guaranteed a sale. Instead, I have gone to the BFG community for a list of relaxed mode TM games. Already downloaded two new ones so Bloom will have to go back on the shelf. Sorry devs...not relaxing and fun, not a buy for me. Rated 4 out of 5 by Fiat500Gucci from Fun but could be better This one is fun but it only gets four stars from me due to game play being kind of sloppy with so many pop up windows in it that interrupt clicking. There has got to be a better, smoother way. Graphics design seems outdated, too (think Flo). The whole game feels old. Nevertheless, I bought it because overall it is a fun TM. Rated 3 out of 5 by Capi1296 from Too Easy Was too easy to master quickly. Rated 3 out of 5 by joyoney1 from I love TM games but this is sooooo slow! I have windows 10 so I played it in full screen and windowed modes and I could nap while she walked. Speed it up and I'd probably loved it.